Week 3 of the college football season has come to a close. We had a wild Saturday around the country. A pair of top 10 teams–Auburn and Wisconsin–lost home games. Meanwhile, Alabama routed Ole Miss and Ohio State registered a big resume win over TCU. 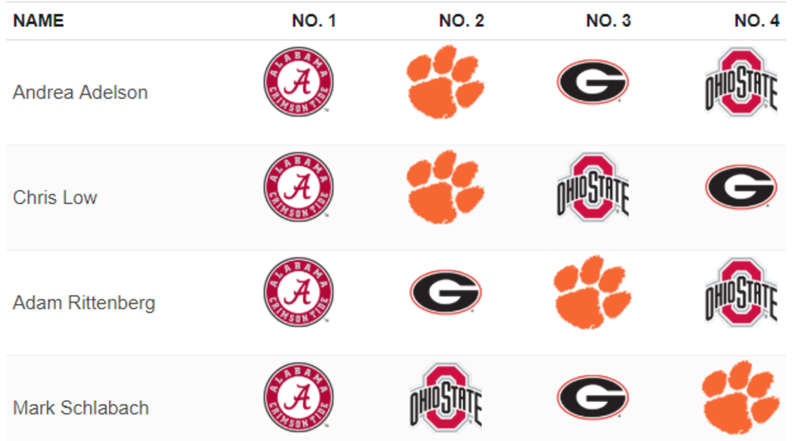 ESPN’s panel of experts released its College Football Playoff picks after Week 1. Andrea Adelson, Edward Aschoff, Chris Low and Adam Rittenberg made their selections. All four of them have the same quartet of teams in the playoff, but their seeding is different, save for all having Alabama at No. 1. It is still pretty early to think about the College Football Playoff. We won’t get actual rankings for another few weeks. However, it is clear right now that these four teams have set themselves up ahead of the pack. There is a lot of football to be played, but Alabama, Clemson, Georgia and Ohio State are the clear-cut playoff faves as of now.